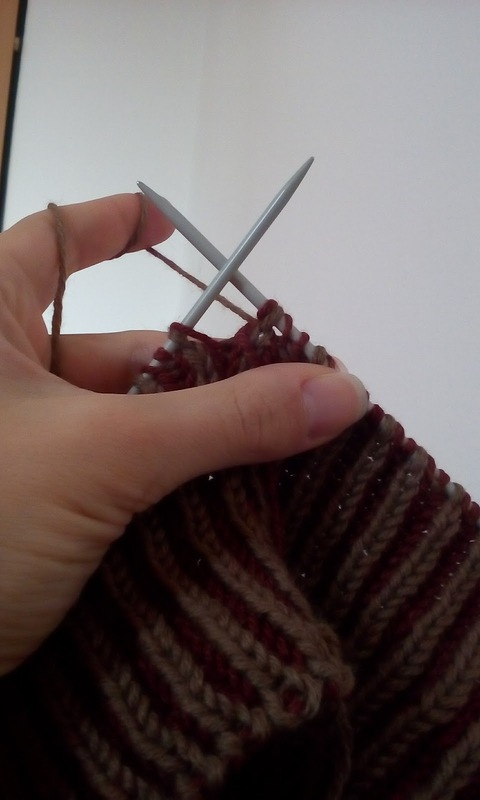 This winter there was either time to knit or write about it, so clearly I made no new posts! 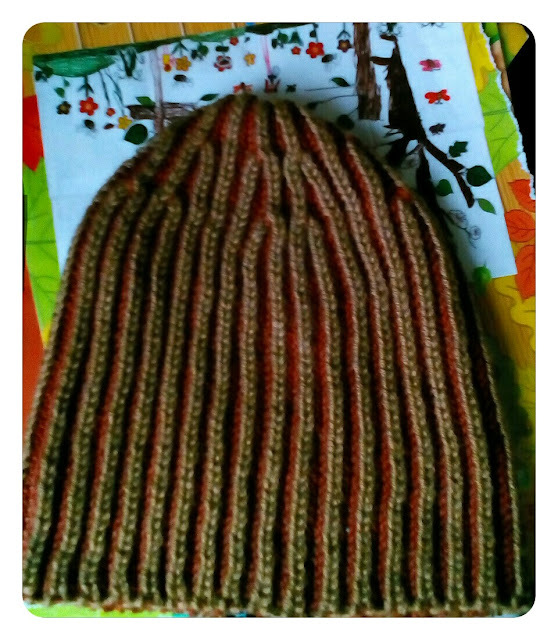 However, I've been rushing this week to finish a hat for a very special little boy. Only three months after our daughter was born, our dearest friends became parents to Philip, that sweet smiling face. And a bit later we became godparents! 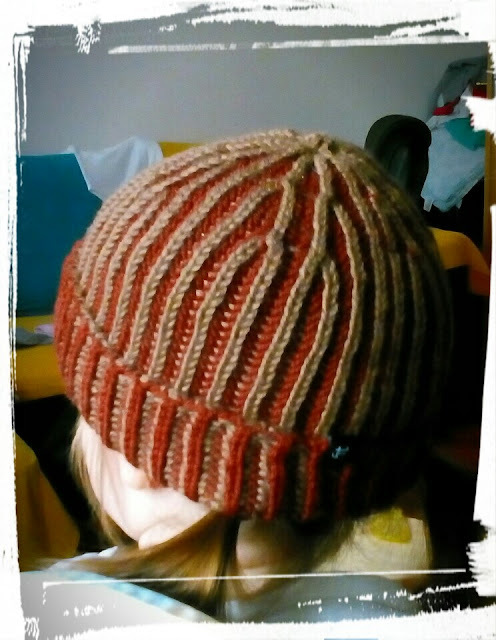 The hat that I've just finished and my girl is wearing on the photo should be one of his birthday presents (don't worry, he'll get plenty of fun stuff, too). And I had to share this pattern since I know there are many wonderful smiling faces out there and some of them might need a hat just like this. Here's the Ravelry link to the PDF version of the pattern, but I would like to add some details. The DK yarn I used has 3,5 - 4 mm recommended needle size, but it is quite common with brioche patterns to use slightly smaller needles and here I used 3 mm double pointed ones. 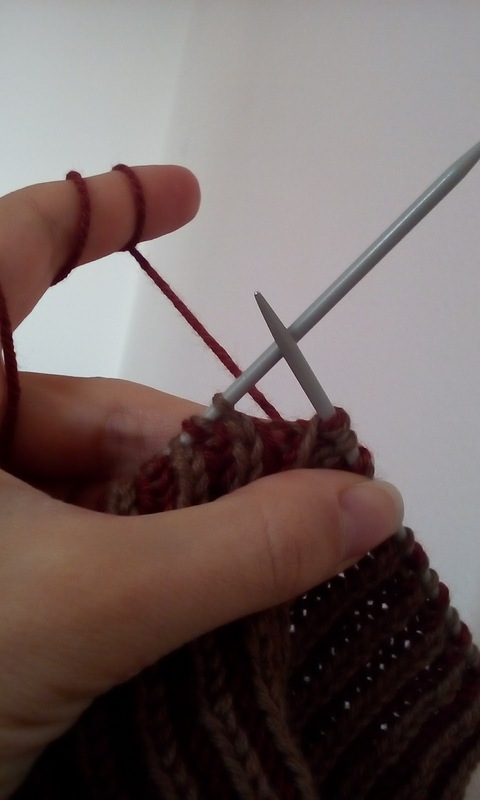 The gauge is 18 stitches to 10 cm when the work is just a bit stretched. Light yarn is 50% wool, 50% acrylic, while darker one is 50% wool, 50% cotton blend, so the hat should be warm, but not too warm. To add some warmth to the ears, I made the bottom part longer in order to fold it. If you don't want this, simply start decreasing after 10cm from cast-on edge. Since the hat is quite stretchy and the brim is adjustable, I hope this also means it can be worn longer. It should certainly allow for some growth. 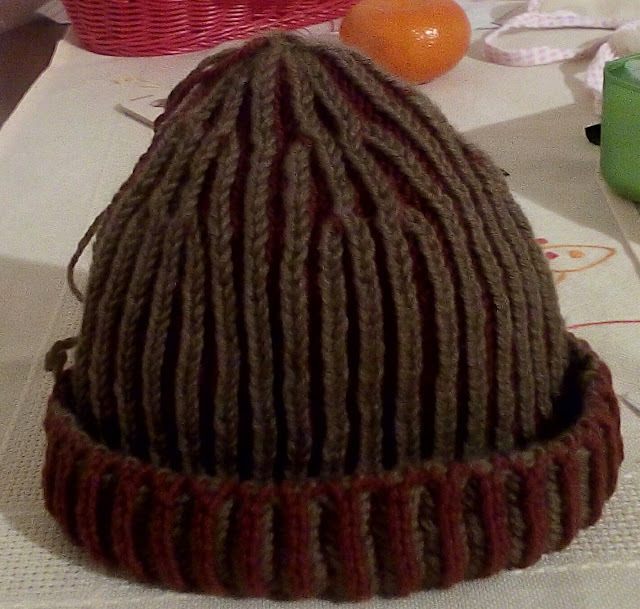 It's difficult to be very precise about the size, but the idea here is to have a hat that would definitely fit around 12 - 18 months (45-48 cm head circumference) and how much earlier or later it could be worn depends a lot on the child. My daughter is 15 months old and the hat fits perfectly, with plenty of room left. The beginning is a bit messy, but after 5 or 6 rounds it becomes quite relaxing. 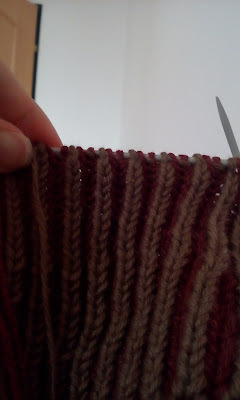 Even if you're new to brioche knitting, it's not very difficult to work in two colors, you only use one at the time. I just wouldn't say that this is really a quick knit. The number of stitches indicated doesn't include the yarn overs, stitch with a yarn over counts as one stitch. To cast on, you need a piece of scrap yarn. Using this yarn and a DPN, cast on loosely 35 stitches. Take two ends of your working yarn, light and dark colored ones, and tie them together. 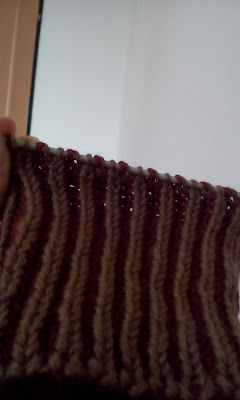 First row is worked in the right side color (in my case, light brown yarn). At the end of each row or round you switch. 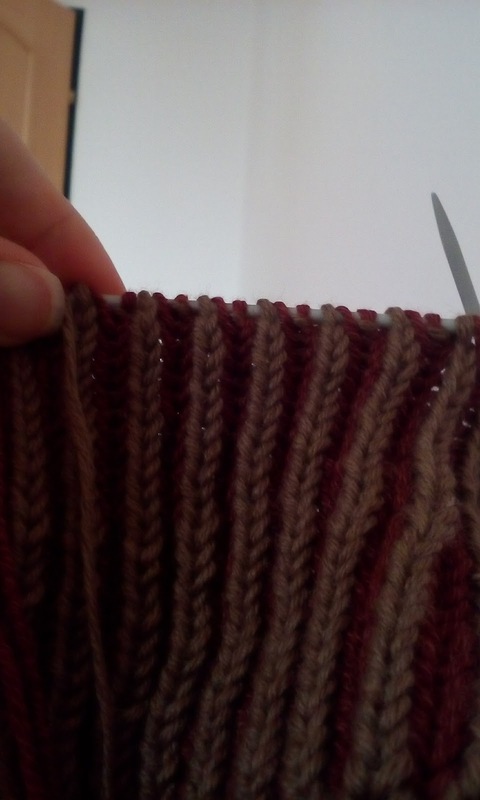 During the first row you should probably distribute the stitches to 3 or 4 DPNs to make it more comfortable. You now join to work in the round with the following rule: once you are finished with one color, take this yarn to the front and let it hang there before picking up the other color. This should keep the yarn from crossing. After Round 2 you can unravel the piece of yarn used to cast on and admire how nice and reversible it is. Repeat rounds 4 and 5, ending with round 4 until the work measures 11 cm for a hat without brim or additional 5-10 cm for a hat with a brim. Continue with Rounds 4 and 5 for another 3cm, ending with Round 4. Continue with Rounds 4 and 5 for the same number of rounds as between 1st and 2nd Decrease Round. Cut both yarns leaving long tails, thread the light colored yarn into a needle and pass it through the remaining stitches, then tie a firm knot with dark colored one. 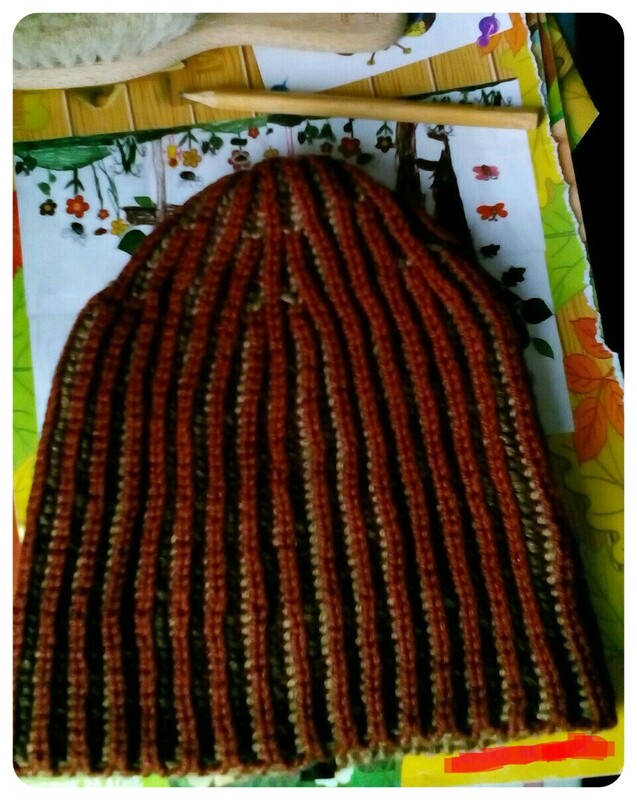 Weave in ends neatly to get a reversible hat. As a final touch, I also added a small label to mark the back side. 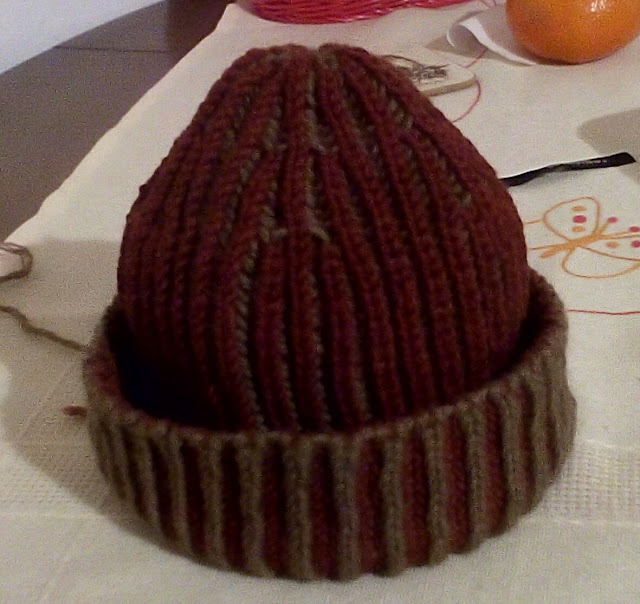 And the hat is finished! Lovely. My granddaughter is also name Ella for her great-great grandmother. Is Ella getting a new hat? That would be lovely, too.